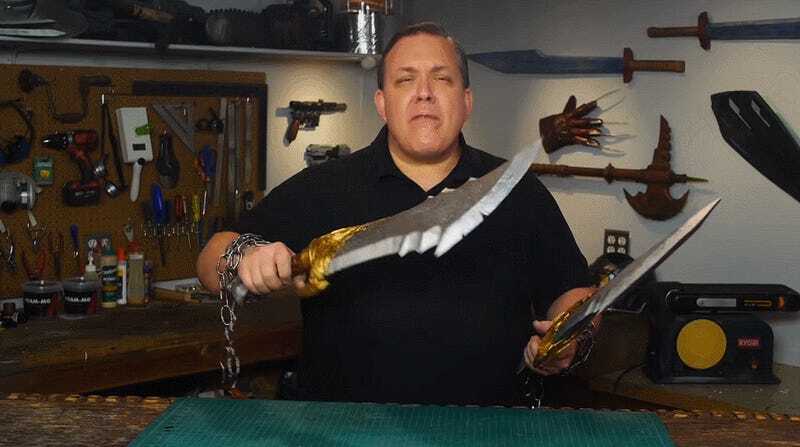 If you’ve ever thought about what it would be like to swing the mythical Blades of Chaos around your head on chains wrapped around your arms, YouTuber Odin has you covered. Oddly, there are some spoilers about God of War in this video. Be aware! The Blades of Chaos are, of course, the Spartan protagonist Kratos’s weapons from every entry in the God of War franchise, and their uses as swinging whirlwind blades mean that they both look a little odd and they need to be able to be swung around on chains. While we don’t get a demonstration, they do look very swingable, so hopefully no one gets clocked in the head with one of these at a convention. I’m a big fan of the Odin Makes videos, and it is mostly because of how no-nonsense they always are. If you’re interested in making high-quality cosplay items, then there are much worse places for you to learn from than these videos. And I write this as someone who has approximately zero interest in cosplay or making any kind of fantastical weapon. Odin’s videos are awesomely watchable precisely because of their immaculate attention to detail and process; I always feel like I’m getting some kind of super personalized episode of How It’s Made. However, watching the Blades of Chaos get so perfectly replicated makes me wonder about a version of Nailed It where the participants try to recreate cosplay items. I’d watch that.